The MTD Gold Snow Thrower M54LG has a 28 inch clearing width and a 21 inch intake height for those high drifts that winter brings. It is powered by a 277cc engine winterized engine and comes with 12 inch augers and a 12 inch impeller. This snow thrower is great for most urban situations and comes with lots of features that many people will appreciate. The heated handles is one feature that will please everyone. If you have been outside blowing snow in freezing temperatures, your fingers often get very cold when you have to hold on to the cold steel handles. With heated handles, you will never need to deal with this issue again. Having cold hands makes it very unpleasant to be outside blowing snow. This snow thrower comes with 6 forward and 2 reverse speeds, which is pretty standard in the industry. It has an electric starter, however it does not have clickable steering that some other models have. Clickable steering allows you to change direction by clicking a trigger switch, which can be useful if you do not like to manhandle a snow blower. This snow thrower has lots of features as listed above. We like the in dash yard light. Operators will find this useful if you are blowing snow in poor light conditions in the evening or early morning. Also the tool less drift cutters are an advantage especially if you get heavy snow that drifts across your driveway or walkway. The engine comes pre-filled with oil, however we recommend that you always check the oil level before starting to make sure that there is sufficient oil in the engine. It can be ready to go in minutes, just unfold the handles, check the oil level, add fuel and you should be ready to go. Read the instruction book first before operating for the first time. 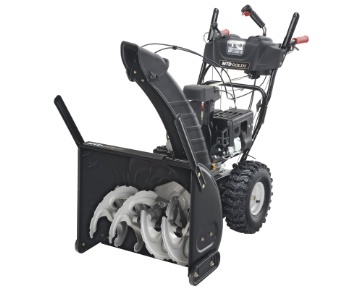 This MTD Gold Snow Thrower M54LG is a powerful machine and should be treated with safety in mind. Carefully read all of the safety guidelines in the manual prior to operating the machine for the first time and follow these guidelines to ensure that both you and the machine do not have an accident. Prior to starting the MTD Gold Snow Thrower M54LG the first time each day, perform a quick walk around check of the machine to ensure there are no loose parts and no leaking fluids. Check the engine oil to ensure that it is at the correct level as specified by the manual. Top up if necessary. Fill the fuel tank while the engine is cold and prior to using the machine. If you do spill fuel, wait until it has fully evaporated prior to starting the engine. Never spill fuel on a hot engine to avoid fires and always fill the fuel tank outdoors to avoid any possibility of vapors going into your house. If you have a lot of snow to clear and a large area, then the MTD Gold Snow Thrower H55LH with a 30 inch wide clearing width may be the machine for you. A 357 cc engine with a 21 inch high intake and 30 inch width will clear a lot of snow quickly. Both the augers and the impeller are 12 inches in diameter. It also comes with 6 forward and 2 reverse gears to match the speed you are comfortable with as well as the snow load that you have to deal with. With lots of snow you will want to go a little more slowly, while with light snow falls you can motor along at a comfortable walking speed. Let the machine do the work at your speed rather than trying to manhandle a heavy snow blower. This snow thrower also comes with heated handle grips to keep your hands warm in the coldest temperatures. How many times have you been outside in -30degree temperatures with your hands freezing while blowing snow. This has to be one of the best features that has been added to this snow blower. Another great feature is the steerable wheel drive with the click of trigger. No need to try to manhandle the snow blower, just click the trigger to change direction. Additional features to those already discussed include: 4 way chute control so you can direct the snow in any direction you want, single hand controls, in dash yard lights for night time snow clearing, tool less drift cutters, folding handles for storage in your garage. You can assemble your new snow thrower within minutes with no tools. The engine comes pre-filled with oil, however we recommend you always check the level of oil before starting the engine. Add fuel and you are ready to go! 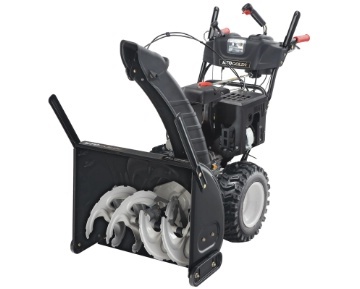 This MTD Gold snow blower is a powerful machine and should be treated with safety in mind. Carefully read all of the safety guidelines in the manual prior to operating the machine for the first time and follow these guidelines to ensure that both you and the machine do not have an accident. Prior to starting the MTD Gold Snow Thrower H55LH the first time each day, perform a quick walk around check of the machine to ensure there are no loose parts and no leaking fluids. Check the engine oil to ensure that it is at the correct level as specified by the manual. Top up if necessary. Fill the fuel tank while the engine is cold and prior to using the machine. If you do spill fuel, wait until it has fully evaporated prior to starting the engine. Never spill fuel on a hot engine to avoid fires and always fill the fuel tank outdoors to avoid any possibility of vapors going into your house. Finally never point the chute in the direction of people, buildings or cars to avoid any possible damage and accidents. Sometimes chunks of ice can be thrown at high-speed from the chute and if they hit something, it can cause a lot of damage. Like all snow blowers or snow throwers, maintenance is important for your machine to operate at a peak level for many years. Change the engine oil regularly. Check the belts for tightness. Change the spark plug as required and grease any spots outlined in the manual. If you need to leave the snow blower outside all year round, cover the machine with a proper cover to keep it looking new and avoid deterioration of the tires and metal components. The MTD Gold Snow Thrower M53LE snow blower comes with a powerful 208cc winterized engine that will clear 24 inches of snow at a time and the best part is that it comes with heated handles. This really separates it from other snow blowers. If you have been out blowing snow in really cold weather with freezing fingers, you will really appreciate heated handles. There are 6 forward speeds and 2 reverse speeds to provide you with the best pace for the snow conditions you are dealing with. Lot’s of snow means you may want to go a bit slower, while a light snow covering means you can go at your own comfortable walking speed. Another big advantage of this snow thrower is the steerable wheel drive feature. Just touch a button to change directions with this powerful snow blower. No more wrestling the snow blower to get it to go in the direction you need it to go! There are lots of features on this snow thrower. A lot of people do not want to have to pull the starter chord. With the MTD Gold Snow Thrower M53LE snow blower, you can use the electric start to start your engine! 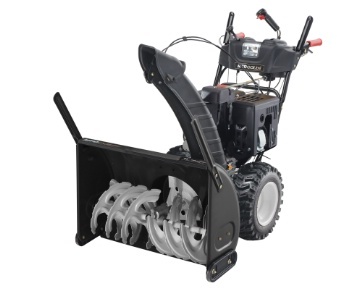 Among the features of this snow thrower that really stand out, are the yard light, the direction control, the heated handle grips, the folding handles and tool less drift cutters. Once you get your new snow thrower home, set up is easy, just unfold the handles, no tools required, add fuel to the fuel tank and you are ready to go. There is oil already in the engine. Even though the manufacturer has provided oil in the engine, we always encourage our readers to check the level of engine oil before starting the engine. This MTD snow blower is a powerful machine and should be treated with safety in mind. Carefully read all of the safety guidelines in the manual prior to operating the machine for the first time and follow these guidelines to ensure that both you and the machine do not have an accident. Prior to starting the MTD Gold Snow Thrower M53LE Dual Stage Snowblower the first time each day, perform a quick walk around check of the machine to ensure there are no loose parts and no leaking fluids. Check the engine oil to ensure that it is at the correct level as specified by the manual. Top up if necessary. Fill the fuel tank while the engine is cold and prior to using the machine. If you do spill fuel, wait until it has fully evaporated prior to starting the engine. Never spill fuel on a hot engine to avoid fires and always fill the fuel tank outdoors to avoid any possibility of vapors going into your house. The MTDPRO Snow Thrower H64FG is ideal for one car and two car wide driveways. Small enough to store in most garages, yet powerful enough to handle the snow in most driveways, this snow blower is perfect for suburbia and clearing snow. With an electric start there is no need to pull your shoulder out while trying to start this snow thrower. Operators can steer the snow blower with one hand while adjusting the direction of the chute with the other hand. Whether you pick up this snow blower yourself or have it delivered it is tested and ready to go. All you need to do is check the already installed engine oil level, add fuel to the fuel tank and you are ready to go. Set the speed of the MTDPRO Snow Thrower model H64FG to match both your preferred walking speed as well as the depth of snow you are trying to clear. Heavy wet snow may require a slower speed to allow the snow thrower to throw the snow sufficiently without becoming bogged down in wet snow. Drift cutters already installed will help to cut through drifts higher than the 21 inch intake height. Most people let the snow blower do the work, preferring to steer with one hand and using the forward and reverse gears to move the machine to any desired location. The in dash yard light is both a tool to light your way at night while you are clearing the snow from your driveway and at the same time it is a safety light to alert others that you are nearby. Cars will be able to see you easily at night. The heavy duty slide shoes protect the housing of the snow thrower. They can be adjusted to adjust the scraper height of the snow you are clearing from your driveway. The polymer chute will not crack or rust and will allow you to point the snow in any direction. The MTDPRO Snow Thrower H64FG can be purchased at The Home Depot and also at Home Hardware stores across Canada. Customers can visit the local web site of these companies to find the nearest location to you. Arrangements can be made for delivery, self delivery using Home Depot rented vans or self pickup. 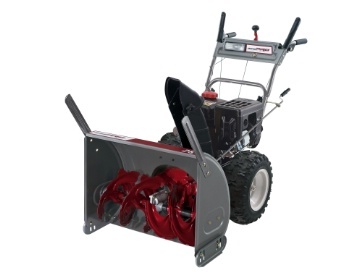 No accessories were listed for this snow blower on the MTDPRO web site. Before you start the MTDPRO Snow Thrower model H64FG for the first time, read the manual and follow all initial starting checks as well as safety procedures. Confirm that there is sufficient oil in the engine and also fill the fuel tank for the first time with fresh fuel. Never point the chute in the direction of people, cars or buildings while operating the MTDPRO Snow Thrower model H64FG. Ice pellets and stones can be thrown from the chute at high rates of speed causing damage to anything in their way. Get into the habit before you start the MTDPRO Snow Thrower model H64FG for the first time each day by checking the engine oil and the fuel level. Top up as required. Also complete a check of the snow thrower for any areas that need adjustment of repair. Make sure there is no debris or ice in the auger or impeller area. Never try to clear debris from the auger or the impeller while the engine is running. Always shut the engine off before attempting to clear ice and snow from this area. When you are finished for the day, clean all snow and ice off the housing and from the auger and impeller area. This will prolong the life of your snow thrower for many years by protecting the housing from corrosion. Again check the manual for all recommended maintenance procedures and timing. Change the oil as needed and recommended in the manual. As a minimum change the oil once per year to prolong the life of your engine. Repair all loose and broken items immediately to avoid further damage. Replace all shear bolts as soon as they break.